I've made more book, this time following another technique called "coptic binding". I'd wanted to know how to do it for a while, and was surprised at how easy it is! I made a few mistakes here and there but can't really see it, and it's going into my stash of emergency presents. 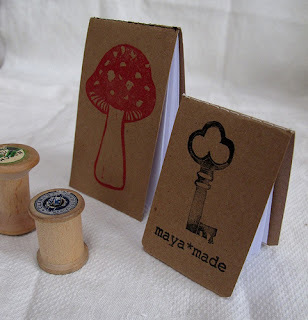 After making it I stumbled upon this post on Mayamade, so clever! And easy too. I set to making some for myself straight away. I have a stash of opened envelopes I keep for making notes, but they often get misplaced or lost, so sewing them into a little notebook is genius! And since I also keep a variety of cards that get sent to us, I used them for the covers.